The Sunbury United Methodist Church Players presents An Evening of Comedic One-Act Plays next weekend, April 13-15. “Sagebrush Sidekicks” is set in the old West, with a hero holding a contest for who will be his next sidekick. “Das Box” is a funny mystery about the contents of an unopened box. Cast and crew members, in and out of costume, include (left-to-right): Larry Layton, Penny Hill, Terry Yates, Joey Jerome, Jeff Endslow, Steve Clements, Bev Endslow. Showtimes are 6:30 p.m. Friday; 7:30 p.m. Saturday; and 2 p.m. Sunday. Tickets are $20 for Friday and Saturday, and includes dinner; $10 Sunday. For reservations, call Phyllis Taylor, 740-965-3293. SUMC is at 100 West Cherry Street, Sunbury. 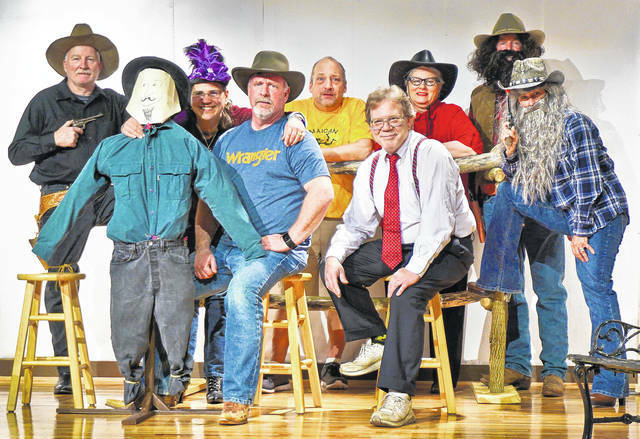 https://www.delgazette.com/wp-content/uploads/sites/40/2018/04/web1_DSC02630_1.jpgThe Sunbury United Methodist Church Players presents An Evening of Comedic One-Act Plays next weekend, April 13-15. “Sagebrush Sidekicks” is set in the old West, with a hero holding a contest for who will be his next sidekick. “Das Box” is a funny mystery about the contents of an unopened box. Cast and crew members, in and out of costume, include (left-to-right): Larry Layton, Penny Hill, Terry Yates, Joey Jerome, Jeff Endslow, Steve Clements, Bev Endslow. Showtimes are 6:30 p.m. Friday; 7:30 p.m. Saturday; and 2 p.m. Sunday. Tickets are $20 for Friday and Saturday, and includes dinner; $10 Sunday. For reservations, call Phyllis Taylor, 740-965-3293. SUMC is at 100 West Cherry Street, Sunbury.